Found under the Accounting section of the Reports page, the Payments report summarizes the payments recorded for your members and tracks the actual income you have received for your program. Takes into account refunds, pending payments, and rejected payments. The report can be generated for all dates. 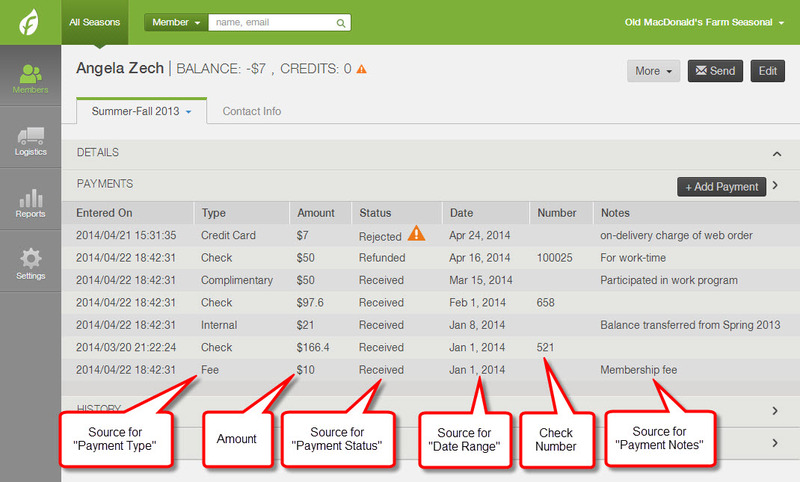 The data used to generate this report comes from all payments listed under the PAYMENTS header of the member account. DATE RANGE: You may select dates that occurred in the past. You may also select dates that occur in the future to review pending payments that are due in the future (see the Project Deposits report for more information). 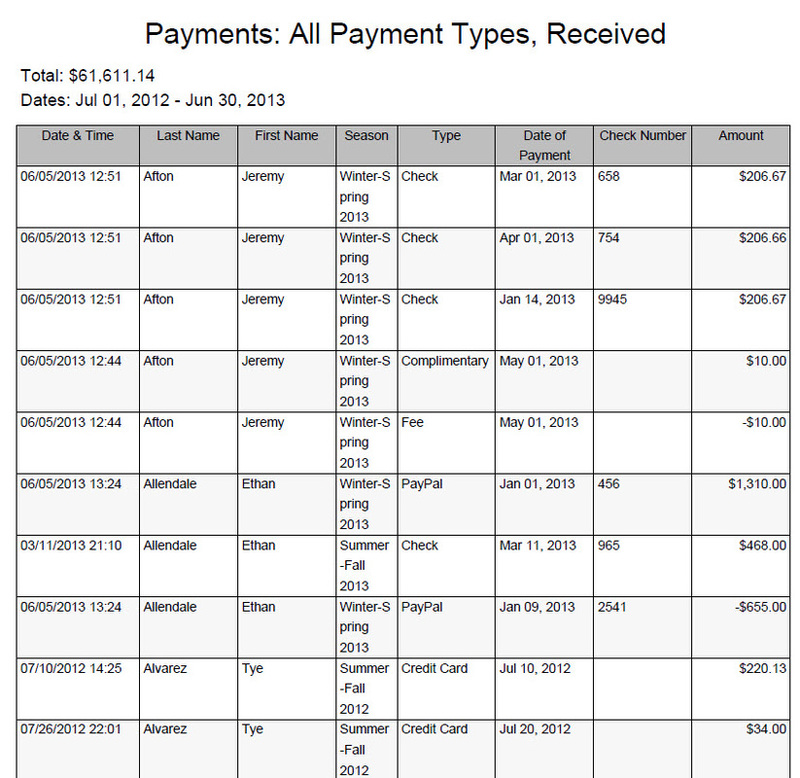 The report will include payments made toward the season selected in the upper left corner. Received - The report will count all payments from member accounts which are marked as Received as Positive amounts and all payments marked as Refunded as Negative amounts. Please note that the Payment Type of "Fee" will be noted as a Negative amount when its status is Received. Pending - The report will summarize all payments with a status of Pending. Pending payments with an associated date that occurred in the past are considered past due. Pending payments with an associated date that will occur in the future are not considered as currently owed. See the Projected Deposits report for more information about pending payments due in the future. Rejected - The report will summarize all payments that are currently marked as Rejected for the specified date range. SORT BY: This option helps you to organize how the data is presented. 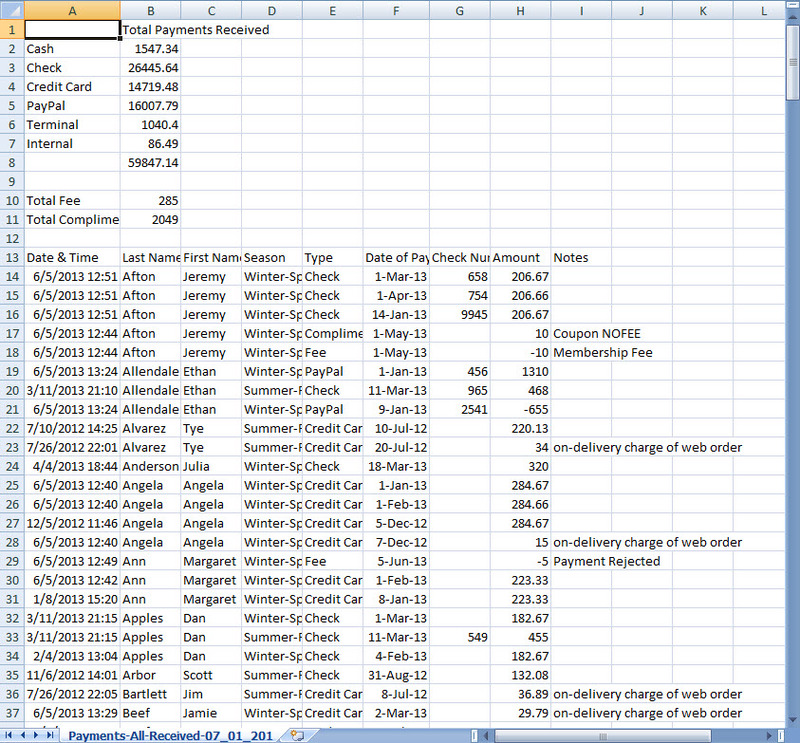 You may list transactions alphabetically ascending by member last name or chronologically by transaction date. When transactions are listed chronologically, the date corresponds to the "Date" column from the payments listed under a member account. INCLUDE SUBSCRIPTION DETAILS: If you check this box, the report will include a column that lists the items the member purchased when they made the payment. Keep in mind, if the member is paying in installments or monthly payments, they will have only paid for a portion of the items listed. The default settings of the Payments report, where PAYMENT TYPE = All and PAYMENT STATUS = Received, shows a summary of payments listed with a status of received or refunded. This output provides you with a printable report. Total deposits are listed at the top. A CSV file is readable in most spreadsheet software programs, such as Microsoft Excel. This output provides you with data that is easy to manipulate. It also lists totals broken down by payment type at the top and includes any payment notes associated with member payments.